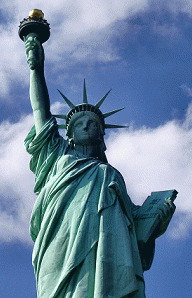 After reading reports that on Wednesday, President Obama plans to propose cuts to Social Security and means-testing for Medicare, I have come up with a proposal of my own: I suggest an update to Emma Lazarus' poem, The New Colossus -- the poem that made the Statue of Liberty "a symbol of hope to the outcasts and downtrodden of the world." Lady Liberty's poetic message no longer describes the U.S. The union members whose jobs went off-shore. They're good for Wendys', Walmarts, prisons, and war. While I'm on the topic of truth-in-advertising, I ask you: What should Social Security be called after it's been "reformed"? Personal Responsibility Deniers, Moochers, Takers, Self-Proclaimed Victims, Welfare Queens, Public Teat Suckers, Unite! Calling All Good-Hardworking-Americans, People Who Won't Lift a Finger to Help Themselves, Spendthrifts, and Takers!